Washington’s Evan Upthegrove puts up a jumper during a non-conference home-opening game against Circleville Tuesday, Dec. 4, 2018. 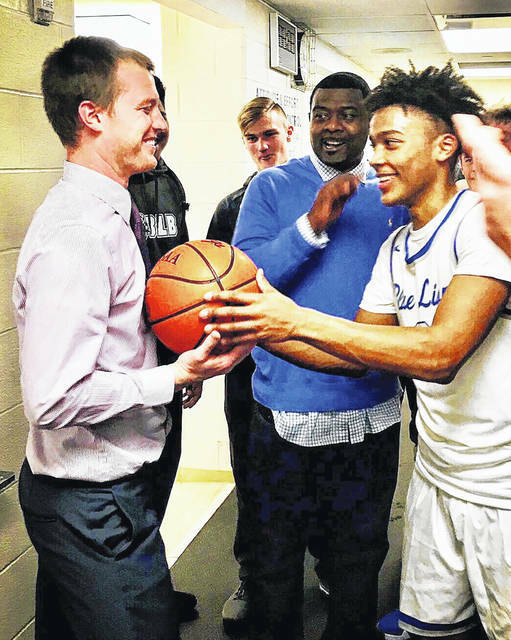 Washington Blue Lion head coach Connor Scott (left) receives the game ball from senior Evan Upthegrove to commemorate Scott’s first varsity coaching victory Tuesday, Dec. 4, 2018. Also pictured is assistant coach Adrian Parks and behind him, Eli Lynch. 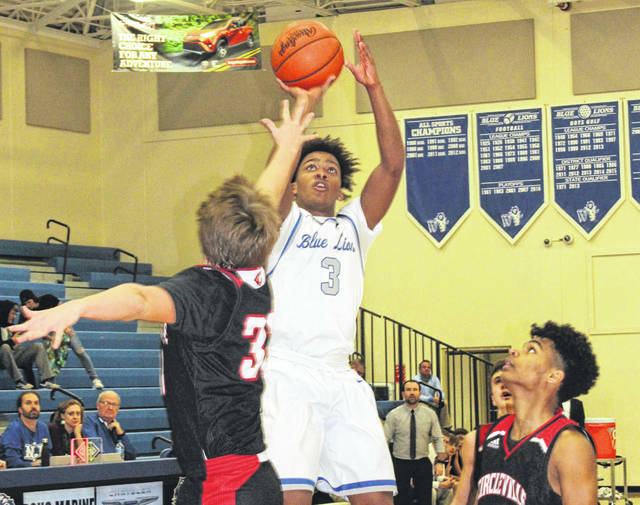 The Washington Blue Lions were coming off a tough, season-opening three-point loss to Lancaster when they welcomed the Tigers of Circleville High School for another early season non-conference match-up. The Tigers came into the game with wins over Miami Trace and New Lexington. The game had nine lead changes and Washington’s biggest lead was seven points. The most the Tigers led by was four points. So, it came as no great surprise that the game went into overtime, where the Blue Lions emerged with a 57-54 victory. “We need to learn how to win and I think this game was a step to learning how to win,” Washington head coach Connor Scott said, still very excited after his first career coaching victory. Scott was pleased with his scoring leaders, Dillon Steward and Evan Upthegrove. Circleville led 12-10 at the end of the first quarter and the Blue Lions held a 26-22 halftime lead. The Tigers shaved two points off that margin in the third quarter and two more in the second quarter, tying the game 47-47 at the end of regulation. In overtime, Circleville won the tip, but turned the ball over on its first possession. Washington struggled at the free throw line all night, making just 8 of 17 for 47 percent. When it counted the most, Blaise Tayese sank two free throws in overtime to give the Blue Lions a 49-47 lead. The game’s leading scorer, Riley Gibson, hit a lay-up to tie the game, 49-49 with 3:31 remaining in overtime. The Blue Lions missed a shot, but a held ball kept Washington in possession. Washington then missed their next two shots and, after another rebound, turned the ball over with 1:38 to play in the extra period. Circleville missed a three-point attempt and the Blue Lions got the ball and took a time out with 1:16 to play. Washington’s leading scorer, Dillon Steward, cut to the basket for a lay-in to put the Blue Lions in front, 51-49. Steward then had a steal and another lay-up to make it 53-49. Circleville called a time out with 48 seconds remaining. Despite admonitions by Washington head coach Connor Scott not to foul, the Blue Lions quickly did just that. Gibson went to the line and hit two free throws with 47.4 seconds left to make it a 53-51 ball game. Coming out of a time out, Tayese made another lay-up for the Blue Lions, setting the score at 55-51 with 28 seconds remaining. Circleville missed its next shot, but got the rebound and hit another three-point bucket to make it 55-54 with 17.9 seconds to play. After the Tigers called their final time out, Washington turned the ball over with 14.3 seconds left on the scoreboard clock. Circleville had a three-point attempt that was no good. The Tigers fouled Omar Porter with three-tenths of a second left and he made both throws to seal the tightly-contested 57-54 victory. “We had a couple of tough stretches,” Circleville head coach Tyler Cassidy said. “We talked about one of the keys to victory tonight being able to win the battle in between the top of the keys. “(Washington) is a team that really pressures the ball up top,” Cassidy said. “I thought we handled it well at times. When they went on their runs, I felt like we did a good job handling that adversity. “To give our guys credit, we came down, we executed, we fought on that second-to-last possession,” Cassidy said. “We hit a three to go down by one. We forced them into a walk and gave ourselves a chance. That last shot we took, I think we all felt it was going in. It looked clean on the release. “We gave ourselves a chance to win against a pretty good team, I feel,” Cassidy said. Washington (1-1 overall) will open Frontier Athletic Conference play at Hillsboro at 6 p.m. Friday. Circleville (2-1 overall) will begin Mid-State League play Saturday at Hamilton Township. WASHINGTON — Dillon Steward 4 (3)-2-19; Evan Upthegrove 3 (3)-0-15; Ross Matthews Jr. 0-0-0; Blaise Tayese 3-3-9; Omar Porter 1 (1)-3-8; Drew Moats 2-0-4; Trevor Rarick 1-0-2. TOTALS — 14 (7)-8-57. Free throw shooting: 8 of 17 for 47 percent. Three-point field goals: Steward, 3; Upthegrove, 3; Porter. Field goal shooting: 21 of 51 for 41 percent. Turnovers: 11. CIRCLEVILLE — Conner Jones 1-0-2; Riley Gibson 6 (1)-7-22; Evan Justice 0 (3)-3-12; Garrett Gray 0-0-0; Brandon Parr 0-0-0; Ethan Moore 0-0-0; Darcell Picket 2-0-4; Jay Styers 3 (2)-2-14. TOTALS — 12 (6)-12-54. Free throw shooting: 12 of 17 for 71 percent. Three-point field goals: Justice, 3; Styers, 2; Gibson. Field goal shooting: 18 of 39 for 46 percent. Turnovers: 13.